Happy new year I guess! It seems to be February already. This blog was originally set up to report progress on my Triumph car related projects. It seems that I've reported on anything but that so far. Time for a change then! Last year I was concentrating on making some progress with my American van project. There is still a lot of work to do on that but this year I'm hoping to mainly concentrate on the two Triumph Spitfires. The first bit of good news is that there is finally a plan of action for restoring my road-going Spitfire. I visited Karl at KDTriumph last week to look at a bodyshell and some panels he's got for it. Some work is needed to bring the shell up to scratch but nothing excessive. We've decided that the best way to start on this restoration is to obtain a chassis and build up the body tub on that. Then all the other parts can be transferred over from the current car. So I just need to find a good chassis and a pair of rear wings before the real work begins. In the meantime, I've started working on a rebuild of the race car. It's currently still built to the old TSSC class A regulations which means that even allowing for my lack of driving ability the car is noticeably slower than pretty much everything else I'm likely to be racing against. The obvious answer to that is more power and less weight. To that end I've bought a second hand engine and a spare cylinder head and delivered them to Chris my friendly local engine builder. Chris will strip the engine to see what condition it's in. Later in the year I'll take the current engine out of the race car as well and talk to Chris about how to make a more powerful, but still reliable engine. The spare cylinder head is for a cunning plan to do some machining and experiment with what modifications might be possible. We fully expect to completely ruin this first head but should be able to learn what the limits are and what can be done with the "real" one. I have some plans for reducing and redistributing weight in the car too but that will have to wait until the weather improves later in the year (assuming it ever does!) so I can get the car out on the driveway and work on it. There has been some progress so far however in the form of a number of packages of shiny (and not-so-shiny) new parts arriving over the last couple of months. 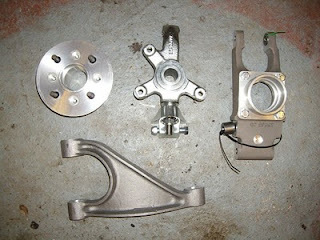 The first arrivals were a couple of Rover 100 Metro driveshafts, one Volvo 340 driveshaft and various other parts needed to make up a pair of CV jointed driveshafts for the Spitfire. Here's one of the Rover shafts minus its inner CV joint which isn't needed for the conversion and I've stripped off. 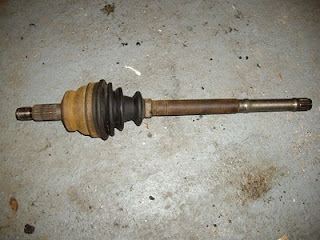 The biggest issue with converting to CV driveshafts in this way (apart from tracking down the Volvo 340 CV joints which are becoming very rare these days) is that the whole of the rear suspension of the Spitfire has to be converted to the Triumph "Rotoflex" design. This was never fitted to the Spitfire as standard but can be fitted relatively easily. Of course that means buying all the necessary replacement parts. Rotoflex wishbones and uprights have a reputation for being heavy old lumps of cast iron. I've gone with the lighter (and much more expensive!) option of some aluminium alloy replacements. These arrived on Friday and are very nice indeed. I haven't actually weighed the parts but they are extremely light. Here's a gratuitous photograph of a whole collection of shiny parts. The more observant amongst you may notice that collection includes a front upright and hub as well as the rear parts. They are part of a kit that uses parts from a Caterham car to strengthen the front axle of the Spitfire. In particular the brass trunnion at the bottom of the upright is replaced with a ball joint. Bigger wheel bearings are also used and that hub is alloy and much lighter than standard. 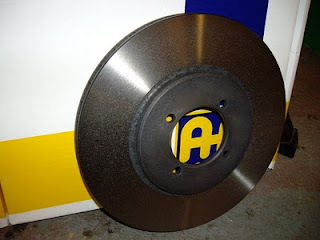 Whilst I was on a spending spree, I bought some new brakes as well. The disks are the same size as the standard ones but are vented for additional cooling. The callipers however are huge. The crusty looking thing in that photograph is a Girling type 14 calliper as fitted to the Spitfire as standard (In case you were wondering, that particular one is usually the doorstop in my garage which is why it's in such poor condition). 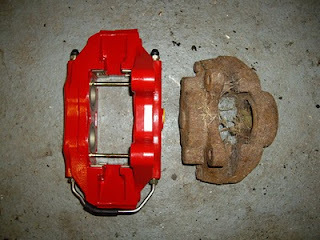 The new callipers are about twice the size of the originals and have a proportionately larger pad area. They should provide some serious stopping ability. The only question being whether they will fit inside my current thirteen inch wheels! Well that lot should keep me busy for a while! I'm just waiting for one CV joint boot and a couple of boot clamps to give me a complete kit of parts for the rear driveshaft and suspension conversion. I'll try and post more pictures here as I go along. You cant bore the rotoflex alloy upright to 67mm for the MGF bearings its WAY too weak, you need steel ones, check sideways-technologies. Also those wishbones are just junk. I did a lot of reading and looked various places before I started this and I couldn't find any reference to anyone who had looked at using the alloy parts for a CV conversion. I've not had all the parts on the bench at the same time yet so haven't had chance to compare th bearing and upright. What makes you say that the wishbones are "just junk"? Again, they only arrived last week so I've not studied them too closely yet. Are they made in the wrong material, incorrectly sized or something? Hopefully I'll have chance to look at all the parts in some detail over the next week or so.